Ross Quarles, left, and Fawzi Noman with SAP awards. Two Sam Houston State University College of Business Administration faculty members have been awarded the 2008 SAP University Alliance Outstanding Service Award. Ross Quarles, professor of accounting and COBA SAP program director, and Fawzi Noman, managment information systems instructor and COBA technology director, received the award during the 2008 SAP Curriculum Congress held recently at Emory University in Atlanta. The award is presented annually by the SAP University Alliance to a faculty member or members from one of the over 200 U. S. and Canadian universities that make up the alliance. SAP is a highly-respected management software that stands for Systems, Applications and Products in Data Processing. It allows data within an organization to be shared as needed throughout the organization. SHSU students trained in its use have an edge in applying for jobs with companies that use it. "We are extremely pleased that Drs. Quarles and Noman have won this award," said R. Dean Lewis, dean of the College of Business Administration. "This is an international award that contributes to the recognition of SHSU as an educational institution on the cutting edge of business technology applications." To be eligible for selection for the award won by Quarles and Noman an individual must be a faculty member at one of the member institutions; support the use of SAP in the classroom; demonstrate positive results from collaboration with other member schools; demonstrate a history of active membership in the alliance through presentations, workshops, curriculum creation, and mentoring other faculty members; and have a history of sharing curriculum materials with other universities in the alliance. 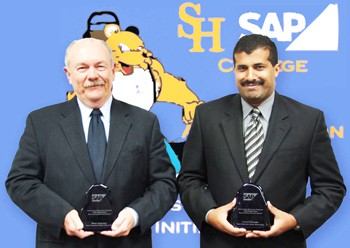 SHSU has been a member of the SAP University Alliance since 2001. During that time Quarles and Noman have developed a number of SAP based cases and curriculum materials that are used in business courses at SHSU. In addition, more than 30 universities in the US, Canada, and Mexico are currently using these cases and materials published through the SAP University Alliance. For the past three years, Quarles and Noman have presented workshops in the U. S. and Canada for faculty from university alliance member universities that demonstrate the use of the materials and teaching methods they have developed. The use of these case materials at SHSU has allowed the College of Business Administration to award a SAP Certificate of Completion to SHSU graduates who have completed at least three courses in which a minimum of 30 percent of the curriculum in each class is SAP-based. The award is accompanied by a $5,000 grant from SAP to the recipient’s university for support of the SAP program at that institution.